Prior to the North German Confederation, German States stamps were issued by most of the separate Germanic kingdoms, duchies, free-cities, etc. of Northern Europe. The Grand Duchy of Oldenburg, located in Northwestern Germany and named for its capital city, existed from 1180 until 1918. In 1871, Oldenburg joined the German Empire. In 1893, a canal was built, connecting the city of Oldenburg to the North Sea, and as a result, the city became a commercial center of great economic importance. In 1918, the Duchy became a Free State within the Weimar Republic. The four German states stamps for the Grand Duchy of Oldenburg shown above were issued between 1852 and 1855. They are lithographed on colored paper, and they are all imperforate. The common design features the Arms of Oldenburg above a center tablet containing the denomination. There are four sub-types of the 1/30 Th. denomination, and there are three sub-types of the 1/15 Th. denomination. Please refer to the Michel catalog for details. 1/3 Sgr. (1855 - Mi. #1, Sc. #1) - Black on Green. 1/30 Th. (1852 - Mi. #2, Sc. #2) - Black on Blue. 1/15 Th. (1852 - Mi. #3, Sc. #3) - Black on Rose. 1/10 Th. (1852 - Mi. #4, Sc. #4) - Black on Yellow. The four definitive stamps for the Grand Duchy of Oldenburg shown above were issued on July 10, 1859. They are lithographed on colored paper, and they are all imperforate. These new designs were larger and a little more ornate, featuring a crown over the Arms of Oldenburg in the center, while the name of the duchy and the denominations are on ribbons at the top and bottom of each stamp. These stamps also have denomination numerals at the sides. 1/3 Gr. (1859 - Mi. #5, Sc. #5) - Black on Green. 01 Gr. (1859 - Mi. #6, Sc. #6) - Black on Blue. 02 Gr. (1859 - Mi. #7, Sc. #7) - Black on Rose. 03 Gr. (1859 - Mi. #8, Sc. #8) - Black on Yellow. 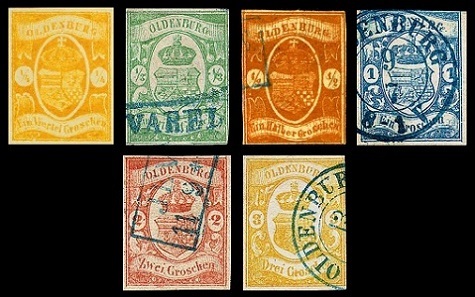 The six German states stamps for the Grand Duchy of Oldenburg shown above were issued in 1861. They are lithographed on white paper, and they are all imperforate. 1/4 Gr. (1861 - Mi. #9, Sc. #9) - Orange. 1/3 Gr. (1861 - Mi. #10, Sc. #10) - Green. 1/2 Gr. (1861 - Mi. #11, Sc. #12) - Reddish Brown. 01 Gr. (1861 - Mi. #12, Sc. #13) - Blue. 02 Gr. (1861 - Mi. #13, Sc. #14) - Red. 03 Gr. (1861 - Mi. #14, Sc. #15) - Yellow. Forgeries and fake cancellations are plentiful on the issues from 1852 to 1861. The buyer should be cautious, when buying any of these stamps, especially if they have not been properly authenticated or certified. In collecting these stamps, having a reference book on the forgeries of this era would be an excellent idea! The five new definitive German states stamps for the Grand Duchy of Oldenburg were issued between 1862 and 1867. The new stamps are printed in different colors, and they are all rouletted. The central design of these stamps features the embossed Arms of Oldenburg. 1/3 Gr. (1862 - Mi. #15A, Sc. #16) - Green. 1/2 Gr. (1862 - Mi. #16A, Sc. #17) - Orange. 01 Gr. (1862 - Mi. #17A, Sc. #18) - Rose. 02 Gr. (1862 - Mi. #18A, Sc. #19) - Ultramarine. 03 Gr. (1862 - Mi. #19A, Sc. #20) - Bister. 1/3 Gr. (1867 - Mi. #15B, Sc. #21) - Green. 1/2 Gr. (1867 - Mi. #16B, Sc. #22) - Orange. 01 Gr. (1867 - Mi. #17B, Sc. #23) - Rose. 02 Gr. (1867 - Mi. #18B, Sc. #24) - Ultramarine. 03 Gr. (1867 - Mi. #19B, Sc. #25) - Bister. Forged cancellations are frequently found on the 1867 issues. 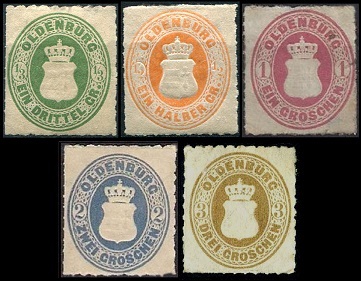 At the beginning of 1868, the stamps of the Grand Duchy of Oldenburg were replaced by those of the North German Confederation.